Recent developments related to the Internet have prompted alarming questions about whether it is fragmenting. They include a diverse set of technical, economic, and policy developments and decisions that have been taken in response to the continued growth and globalization of the Internet, and its evolving role as critical infrastructure for the digital economy. This event is Part 2 of a four-part series of dialogues organized in response to recent developments related to the Internet that have prompted alarming questions about whether it is fragmenting. They include a diverse set of technical, economic, and policy developments and decisions that have been taken in response to the continued growth and globalization of the Internet. “The Business Lens” examines how technology choices and policy decisions that potentially fragment the Internet affect global commerce and economic growth. 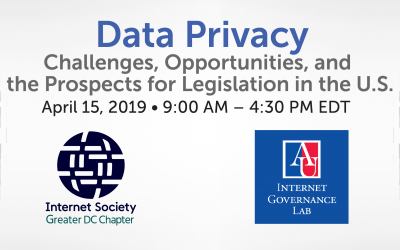 Microsoft and ISOC-DC are bringing together policy stakeholders, including government, the technical community, civil society, industry, and other organizations, to consider these issues more fully. The discussion, the final in a four-part series that has explored multiple facets of fragmentation, will bring together stakeholders from government, industry, civil society, and the technical community to examine how policy decisions can lead to fragmentation, and the impact of such fragmentation on the digital economy globally and nationally. In addition to discussing IGF2017, which was held from December 18 to December 21 in Geneva, participants discuss their observations from the Global Conference on Cyber Space (GCCS) held in November in New Delhi, India, as well as the 4th annual World Internet Conference held in Wuzhen, China, in December. The debate over the role of governments in the realm of Internet governance stems in large part from the inherent contradictions between governments and governance and the Internet and the tensions that have played out over time between policy makers and the Internet governance community as a result of those tensions. The international landscape calls for a more compelling narrative for internet governance than the US –centric one inherited from the ‘90s. Will it be possible to accommodate non-western state’s (this is much more than China and Russia) desire for a larger role for governments without throwing the multi-stakeholder model and (more importantly) human rights overboard? On Wednesday, December 19, 2012 the Washington DC Chapter of the Internet Society (ISOC-DC) presented a WCIT Post Mortem to contemplate the recent World Conference on International Telecommunications in Dubai and the new International Telecommunication Regulations (ITRs) that were drafted there, leading to a lack of consensus among the attending member states. Choosing New Technologies for a Better Internet: Who Decides?